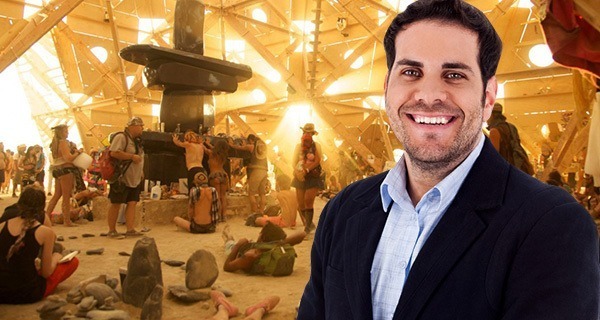 Three hours into his stay, 47-year-old LinkedIn Influencer Brian Hoffman was invited to a peyote ceremony at the Burning Man festival, which he referred to as “low-hanging fruit” before enthusiastically opting in. Hoffman, who was just coming off an all-hands-on-deck blue skying session at his Silicon Valley offices that morning, was approached by a group of onesie-clad artists at 12:15 AM. Hoping he might be able to fund an upcoming installation, they invited him to a Native American–inspired peyote ceremony, which they had learned about from a 24-year-old DJ named Pterodactyl Moon Spree the night before. After briefly running the pros and cons through his head, the millionaire reminded himself to think outside the box. He accepted the invitation by making a joke about drinking the Kool-Aid, but informed them he had a hard stop at 3 AM. Over the course of the 10-hour trip, he hallucinated discovering a fourth-dimension growth hack, circling back to the beginning of time, and literally boiling the ocean. During an unsettling hour during which he heard every grain of sand in the desert whispering of further declines in the Asian stock market, Hoffman was able to pivot by chanting “It is what it is” alongside an imaginary digital prophet made entirely of cotton candy. After the effects of the drug wore off the following morning, Hoffman politely explained he didn’t have the bandwidth to stay longer, but thanked them for bringing him closer to understanding his company’s core competency.